Tenaya Lake is an alpine lake in Yosemite National Park, located between Yosemite Valley and Tuolumne Meadows. The surface of Tenaya Lake has an elevation of 8,150 feet (2,484 m). The lake basin was formed by glacial action, which left a backdrop of light granite rocks, whose beauty was known to the Native Americans. Today, Tenaya Lake is easily accessible by State Route 120 and is a popular lake for water activities. Tenaya Lake is named after Chief Tenaya, who was the chief of the native people who lived in Yosemite Valley before being driven out by the [Mariposa Battalion].. Tenaya protested that the lake already had a name: Pie-we-ack, or "Lake of the Shining Rocks." This original name is now attached to Pywiack Dome, a granite dome to the east of the lake. As part of the 1864 Yosemite grant, the area became the first park land to be federally protected for preservation and public use. Yosemite became a national park in 1916 with the advent of the National Park Service. In 1868, John Muir wrote about the Tenaya Lake's beauty and timelessness in My First Summer in the Sierra. 120° panorama at Tenaya Lake on an early-November morning. Stately Pleasure Dome is prominent center-left and Tenaya Peak, right. Panorama at Tenaya Lake view from east coast on an August morning. Tenaya Lake was created by the Tenaya Glacier, which flowed out of the vast Tuolumne Ice Sheet and down to Yosemite Valley. This same glacier created Half Dome. The Tenaya Glacier was lightly loaded with debris, and did not leave a large amount of moraine material near Tenaya Lake. The lake is supplied by a network of creeks and springs including Murphy Creek to the northwest and Tenaya Creek. Tenaya Creek is an outflow of Cathedral Lakes and serves as both the principle inlet and outlet of Tenaya Lake. Tenaya Creek also runs through Tenaya Canyon into Yosemite Valley. Tenaya Lake can be accessed by car via Tioga Pass Road, which is called California State Route 120 outside the park. Visitors from the east must pass through the Tioga Pass Entrance on the eastern border of Yosemite National Park. Tioga Pass Road starts at the town Lee Vining on U.S. Route 395 140 miles south of Reno and 330 miles north of Los Angeles. Tioga Pass Road is usually closed by National Park Service during the winter months due to heavy snows. The connecting section to the east is closed by Caltrans when the park closes the entrance station for the winter. The lake can be accessed by automobile from the west via Crane Flat, where the Tioga Pass Road meets the Big Oak Flat Road that connects the Big Oak Flat entrance (and CA120) to the park and Yosemite Valley (and CA41 and CA140). According to the US National Park Service, problems associated with visitor use have been persistent for decades. The Park Service has commissioned The Tenaya Lake Area Plan, a formal study and action plan to address solutions to these issues. In 1992 a campground on the southwest shore of the lake was closed. Hiking is a popular activity. Trailheads that start at Tenaya Lake lead to Cathedral Lakes, Clouds Rest, Half Dome, and the Yosemite Valley floor. Fishing is permitted year-round at Yosemite National Park. Visitors over 16 require a valid California fishing license. Various species of trout can be caught in the lake. Visitors can kayak, canoe, or sail on the lake. No formal launch facilities or docks are available, and motorized boats are not permitted. Swimming is permitted, but the water is reported to be very cold. 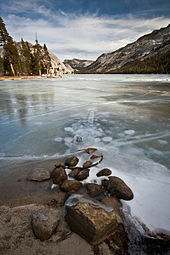 In 2011, $850,000 was earmarked for restoration of Tenaya lake habitat by the Yosemite Conservancy. The program will reroute hiking trails away from sensitive wetlands. ^ "Station Meta Data: Tenaya Lake". California Department of Water Resources. Retrieved October 11, 2005. ^ Farquhar, Francis P. "Place Names – T". Place Names of the High Sierra. Retrieved October 11, 2005. ^ Muir, John (1911). My First Summer in the Sierra. ^ Matthes, François E. (1930). "Ancient Glaciers of the Yosemite Region". Glacial History of the Yosemite Valley. USGS. Professional Paper 160. ^ Schoenherr, Allan A (1992). A Natural History of California. p. 90. ISBN 9780520069220. ^ Matthes, François E. (1930). "Evidences of Glacial Action in the Yosemite Region". Glacial History of the Yosemite Valley. USGS. Professional Paper 160. ^ "Current State Route 120 Conditions". Caltrans. ^ "Yosemite National Park Tenaya Lake Area Plan". National Park Service. Retrieved October 14, 2009. ^ "Tenaya Lake Campground, Central Sierra Nevada, California". Hikercentral. Retrieved October 14, 2009. ^ "National Park Service Hiking Map". ^ "California Department of Fish and Game-Fishing". ^ "National Park Service Guide to Water Activities". ^ "Gofishn.com-Fishing in Tenaya Lake". ^ "National Park Services Guide to Water Activities". ^ "Tenaya Lake Restoration: East Beach". Yosemite Conservancy. This page was last edited on 23 October 2018, at 08:58 (UTC).